OFFICIAL RELEASE: Maverick Crosswords, and June charity drive! 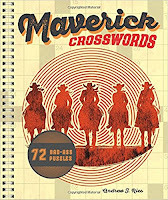 I am proud to announce the official release of Maverick Crosswords! This book is a compilation of 72 puzzles originally published through Aries Xword, which was an email-delivered puzzle service that ran from 2014 to 2017. Edited by Peter Gordon of Sterling Publishing, this spiral-bound book features an equal split of Easy, Medium, and Hard puzzles, mostly themed puzzles but also including a few meta puzzles and freestyles. The book is available in bookstores nationwide or online through Barnes & Noble or Amazon. Also, 50% of all purchases and 100% of all tip jar contributions made during June 2018 will be donated to charity! This includes 2018 Subscriptions, Rows Garden Archive and FIVE purchases, as well as items for sale in the Store page such as The Stagger Sessions, a Crossword EP (now discounted at $8). This year, I'll be donating to the American Red Cross. Thanks to all who have subscribed and donated in the past!